Have you ever wanted to go Whitewater Rafting? Songer Whitewater Rafting offers day trips from mild to extreme with picturesque scenery and tons of fun. 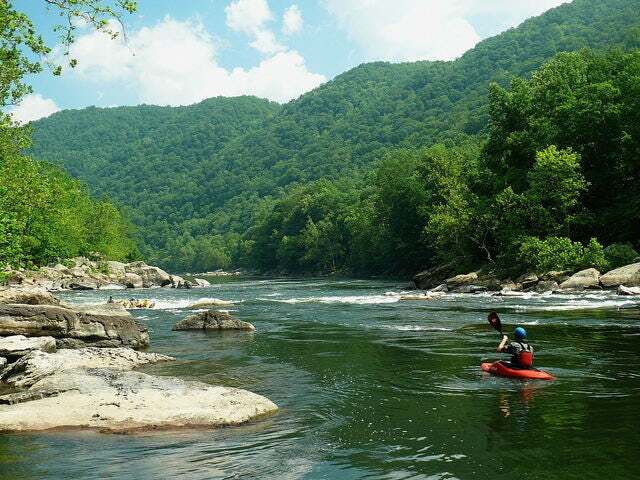 Experience the beautiful scenery of West Virginia with a Whitewater Rafting trip down the beautiful New River and Gauley River set in the New River Gorge area. Whether you are looking for a mild trip suitable for young families or an adrenaline pumping adventure in the white water rapids, Songer Whitewater Rafting has a trip for you. Locals call the area "Almost Heaven" and with the dramatic rolling West Virginia hills and scenic rivers, you will soon agree. For adventure junkies, Songer Whitewater Rafting offers the Upper Gauley River Rafting experience. This full-day adventure will take you to the best river rafting locations West Virginia has to offer, including the five consecutive Monster rapids; nsignificant, Pillow Rock, Lost Paddle, Iron Ring, and Sweet's Falls. Your professional rafting guide will teach you how to paddle through one of the world's greatest rapids. With a lot of hard work and paddling you will be able to experience the West Virginian Whitewater rapids that draw adventure sport enthusiasts from all over the world. To book your Whitewater Rafting adventure with Songer Whitewater Rafting, call us today.